This entry was posted in Uncategorized and tagged Austin Stone, SxSW. Bookmark the permalink. 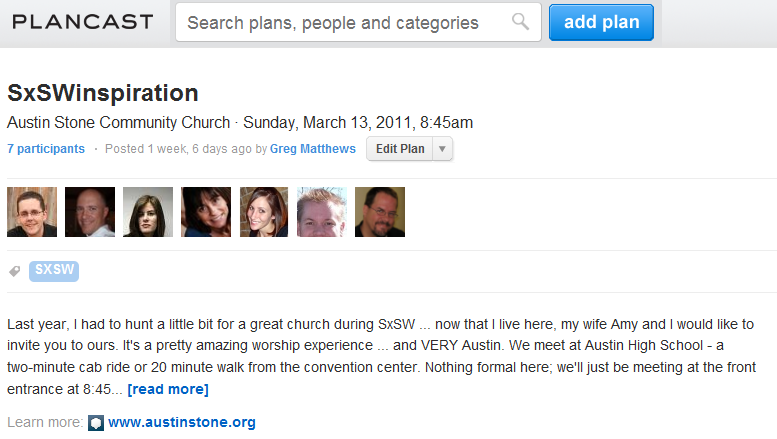 Greg: Thrilled I could join you all for this year’s #SXSWinspiration service at the Stone, even though I had to duck out early (still have to download and listen to the rest of Pastor Jeff’s sermon). In addition to the fellowship, I’m reminded that conferences like SXSW present opportunities to share the gospel to non-believers. I’m praying that God will continue to open these doors for me in my upcoming travels, and that when He does, that I’ll be bold enough to walk through! aspects from all these functions but you will also assist by yourself defeat every and each amount the frustrated you for a while. No a lot more waiting around several hours to get existence or have a restricted amount of boosters. in this resource and compatible with Fb|Apple Units (Ipod|Ipad|Iphones) and Android telephones also. particular blog post is to:. in fact get useful facts regarding my study and knowledge. guest authoring on other blogs? I have a blog centered on the same ideas you discuss and would really like to have you share some stories/information. I know my readers would value your work. These pre-computed numbers, hold on in a very giant information bank for millions or URLs on the net. Saved as ɑ favorite, І really like youyr site! needs to be available that in detail, therefore that thing is maintaied over here.